Family absolutely loved this dish. I would have found it similarly foodgasmic if I wasn't exhausted from cooking three separate dishes at once, but even in my kitchen-induced exhaustion I had to admit – this was pretty yum. 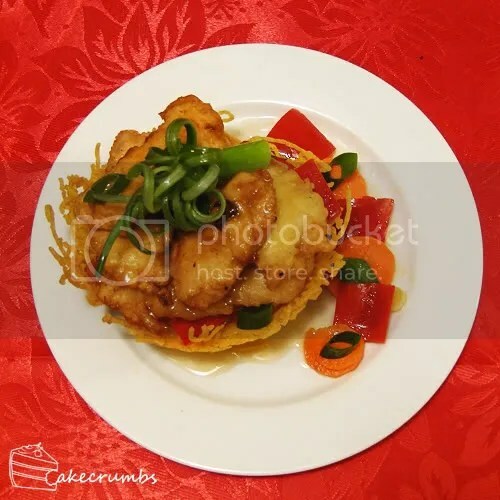 The lemon chicken was served on sautéed carrots, capsicum and shallots. The phoenix nest is made by soaking egg noodles in boiling hot water for a few minutes, then allowing to dry on paper towel over night. 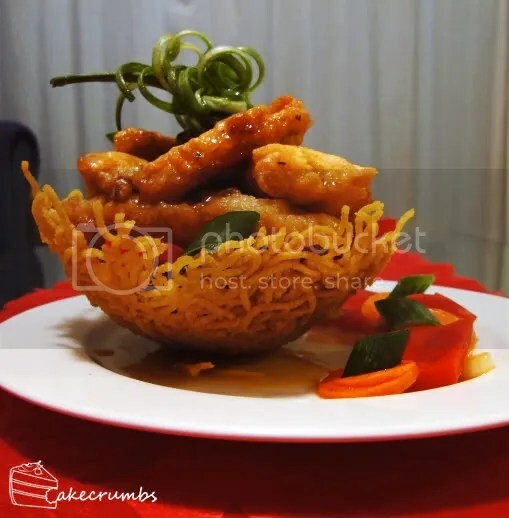 You then arrange the noodles between two lightly greased metal sieves and deep fry. The garnish is just the top of the spring onion/shallot – if you cut the leaves into strips and soak them in iced water for about half an hour they will curl. Fun way to use the discarded tips! Combine ingredients in a saucepan and stir over low heat until sauce boils and thickens. Leave to simmer on lowest heat while preparing and cooking the chicken, stirring occasionally. 1. Remove skin and any excess fat from chicken. Pound out chicken lightly. 2. Put cornflour into a bowl and make a well in the centre. Add water, lightly beaten egg yolks, and salt and pepper to taste. Using a whisk or wooden spoon, gradually work in cornflour. Dip chicken breasts into batter. 3. Fry chicken in deep fryer (this also works with shallow frying – be careful with either method not to let chicken touch or it will clump) until golden brown. Drain on absorbent paper. If required, keep warm in low oven until serving. 4. Slice each breast into desired sized pieces. Serve. Spoon hot sauce over chicken. I was very lucky to enjoy all three of your dishes. I liked this one, because the flavour wasn’t overly sweet like it can be in restaurants sometimes.